Tintern. The jewel in Britain's beautiful Wye Valley. 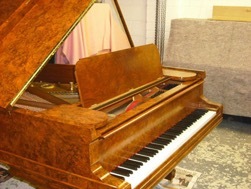 New, used and reconditioned pianos for sale and hire. The Piano Centre has been in business for over 40 years, specialising in new, used and reconditioned pianos, removals and hires. We also buy pianos. Our team can give expert advice, whatever your needs, so please call us on 07860 279194 or 01594 841003 or visit our showroom here in Tintern. Pianos Galore, The Shop, Abbey Lodge, Tintern, Monmouthshire, NP16 6SF.